Yes Sally has been cooking again. 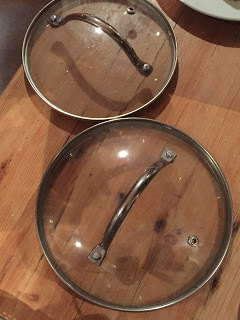 The pan had been destroyed, binned and replaced before I knew anything about it. So what complex culinary concoction (remember the Good Old Days?) could possibly have caused this kitchen calamity. A gentle roux? A flambe? No, boiled carrots. I kid you not. I have now banned her from various pans that remain intact for now. And speaking of YNot, Ole had a thoroughly good time, until he came home and looked in the mirror. 4 days of festival life left him spotty and blotchy. He is now on a get fit program to ensure he is in tip top condition for college life in September. Last Sunday saw the boys play in the same cricket team for the first time, a very proud moment despite the result, and of course Zac predicted the crushing defeat beforehand. The pressure of his younger brother playing spurred Ole on to score 34, his highest total of the season. For some reason, several people are comparing the events of that game to my latest Captain’s Blog! Strange that! The above cricket match featured a huge chilli in the Big Pan that finally ran out of gas. Can’t remember how many Big Pans we have had, but it must be into double figures, not bad for a £23 refill. Next up is the Glossop Lions game on 16th August when we could well return to an old favourite, chicken and potato balti. For all of you youngsters out there, Zac reckons that Facebook is for old people. Instagram is where its at, and he has set up his own account. His followers are growing! I was all set to get a knee brace fitted yesterday, until an opportune call from my physio. Carolyn Edwards has the physio room above the pet shop in Whaley and I thoroughly recommend her. She asked me about the brace, and my consultant, and told me that I should see a proper knee surgeon before making expensive decisions like that. Apparently my knee specialist is just a doctor, a physician, a GP! So, I arranged for another consultation, this time with a Mister as opposed to a Doctor, so I should know more by Monday night. My cycle to Marple took an interesting twist yesterday when Ole and Zac came with me. I didn’t think they would, but spurred on by the prospect of a Costa hot chocolate and a chocolate muffin, Zac did his best to keep up. On arrival Ole was hungry, so the hot chocolates were accompanied by a panini. Once that had gone, the boy Adonis spied a Greggs next door, and so a sausage roll was added to the menu. Suspect we might need to let out those new college trousers a tad.